It may not come as a surprise that there’s something about going to see a play called Men on Boats that makes you believe you’re going to encounter both men and boats. This play has neither men nor boats. Until a few weeks ago, I had never heard of Men on Boats or the Triangle’s Justice Theater Project. So before embarking on an assignment to write about its production of Jaclyn Backhaus’s original play, I started my due diligence to establish a general direction for the piece. It was through that due diligence that I discovered the basics: the story centers around the 1869 expedition of John Wesley Powell, a one-armed Civil War veteran who is famous for this three-month river trip down the Green and Colorado rivers; this journey included the first official U.S. government-sponsored passage through the Grand Canyon; the play made its debut in 2015; and to see any boats, the audience must rely solely on their imagination. As part of this initial research, I had the pleasure of speaking with the Justice Theater Project’s Producing Artistic Director Jerry Sipp, who explained to me that Men on Boats was part of a larger theme driving the direction of the theater’s 2018-2019 season. The theme, “S/He Is. Becoming Whole”, encompasses six shows that focus on women. You may be wondering what a show called Men on Boats is doing in a lineup like that. I know I was. Well, there are no men in this production. While Men on Boats tells the story of ten white male characters, it does so with one important twist—through the voices of a cast made up only of actors identifying as female, transgender, and/or non gender-conforming. In fact, the playwright is adamant that these characters are portrayed by anyone but white males. As Sipp explained, when the board chose the theme last spring, they wanted to ensure they didn’t take a laissez-faire approach. It would have been easy to say they wanted the season to focus on women, pick a few female-centric scripts, and call it a day. Instead, they explored plays that looked at women through many different lenses, through different races, ethnicities, and genders. Sipp said these decisions were made early in the winter of 2018 before the “Me Too” movement, noting the board’s uncanny ability to anticipate social conversations. Men on Boats may not center around this type of character, but it certainly centers around this type of cast. So, on a particularly warm Sunday afternoon in late February, I set out to see the Justice Theater Project’s last performance of Men on Boats armed only with these facts and a lingering cough from a week-long cold. Nervous to disturb other audience members with my incessant coughing, I chose a seat on the edge of a row at stage right. It was immediately clear that the set was minimal, but it wasn’t simple. It was beautifully constructed of various shapes and colors of wood against the backdrop of floor-to-ceiling sheer curtains. While I thumbed through the program to familiarize myself with the cast, the lights went down and Faye Goodwin stepped on stage as John Powell. I was immediately transported to the Wild West of 1869. Thanks to the direction of Jules Odendal-James and an outrageously talented and diverse cast, the next 100 minutes were a journey of comedy, conversation, and anticipation — a bending of history and gender set against the rapids and waterfalls of the Colorado and Green Rivers. It would be easy to assume that a small theater company like The Justice Theater Project, housed in a modest building tucked into a commercial area near Umstead Park, may not offer a high caliber of production. But, if you think that way, then you would be very wrong in that assumption. The quality of production for plays like Men on Boats needs no frills. It speaks for itself, and through the sheer talent of its actors. 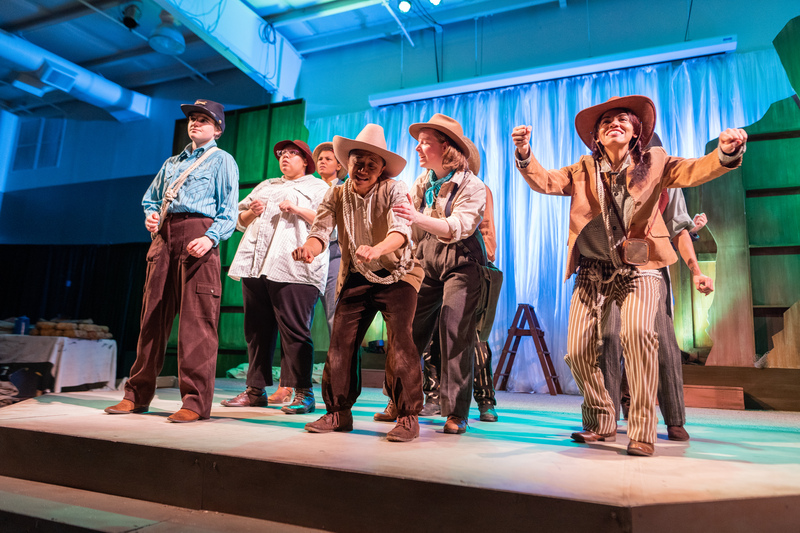 The cast of The Justice Theater Project’s Men on Boats had great dialogue with which to work, but it takes a special talent to perfectly execute comedic timing, and this cast nailed it. And that’s an important thing to nail for this particular script. Because, as I discovered on my journey with Powell and his crew, Men on Boats isn’t just a fun, different way to tell this historical story, rather, Backhaus deliberately uses this diverse, gender-bending cast as a comedic social commentary on America’s white male-dominant history. The American history we learn in school has long been skewed toward a favorable and highly romanticized story, which in reality was brutal and violent. From the reality of Christopher Columbus “discovering” the Americas in 1492 — despite the presence of a culturally rich and well-developed indigenous population — to a group of Black female mathematicians who played a pivotal role in creating opportunities for humans to explore space being casually disregarded until a 2018 film attempted to give them their due, there can be no doubt that America’s history is rich with controversy and rage. Sometimes we choose to cope with this truth through anger or directed action. Sometimes, we choose to cope through the raw human expression of humor and art. This is exactly what Backhaus did. Remember when I said that Powell’s expedition included the first government-sanctioned passage through the Grand Canyon? That small detail is actually an important part of this story. Backhaus notes it in her dialogue as Powell tells his crew about the people who have taken this journey before, to which one of the crew members responds “I thought we were the first.” This scene in particular was a stand out example of Goodwin and the rest of the Justice Theater Project cast’s talent. Watching Powell’s long, perilous, and slightly frustrating journey could get old fast, but with a cast like those at The Justice Theater Project, this play was entertaining to the very last waterfall drop. And judging by the standing ovation, I would say the rest of the audience agreed. Men on Boats won’t change history, but it does allow us to look at it through a different lens. It does bring to light a new way of thinking for the future, which is why as an organization that focuses on having conversations about social issues with the community, it was a perfect fit for The Justice Theater Project. Of course, Sipp told me, The Justice Theater Project, like most theaters at their core, wants to produce engaging and entertaining theater. But, they also want people to continue thinking about the show long after they leave. I have to say, it’s working. The Justice Theater Project unveils its 2019-2020 season theme “From Monologue to Dialogue” this month. Real Women Have Curves, the next show in the S/He Is. Becoming Whole series, will begin its run April 5, 2019. Read more about The Justice Theater Project here.